Sink your teeth into these rich and aromatic gingerbread cookies, spiced with cinnamon and allspice. 1. Beat the butter, brown sugar and molasses together until light and fluffy. Add the eggs, beating well after each addition. 2. In a separate bowl, sift the flour, ginger, cinnamon, allspice, baking powder, baking soda and salt. Add this to the butter mixture and stir until blended. Shape the dough into 2 disks, wrap and chill for about an hour up to 2 days (the dough will still be soft, even once chilled). 3. Preheat the oven to 350 F and line 2-3 baking trays with parchment paper. On a lightly floured surface, roll out the first disk of dough until just over 1/8-inch thick. 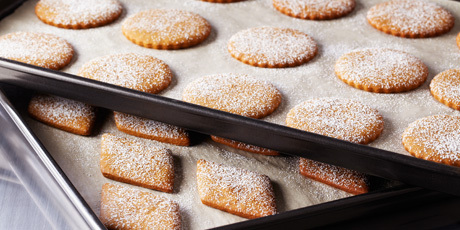 Use a cookie cutter of your choosing to cut out cookie shapes and lift then carefully to the prepared trays, leaving about ½-inch between them. Continue with the second piece of dough – any scraps can be stored chilled and then re-rolled until it has all been used. 5. The cookies will keep for up to 10 days in an airtight container.